USAID’s Office of Health Systems (OHS) released a major new report, which for the first time presents a significant body of evidence linking health systems strengthening interventions to measurable impacts on health outcomes. Family Planning 2020 (FP2020) launched their new 'Rights in Action' blog series to commemorate the third anniversary of the London Summit on Family Planning and the creation of FP2020. The blog series celebrates the longstanding work and dedication of their global partners in upholding the principles of rights and empowerment in family planning. The State of the World's Fathers is the first-ever report to provide a global view on the state of men’s contribution to parenting and caregiving around the world. This blog, written by APC Grantee World Vision, discusses the integration of Healthy Timing and Spacing of Pregnancies and Family Planning (HTSP/FP) within a community-based maternal, newborn, and child health (MNCH) program. Join WHO/IBP, UNFPA, USAID and the IBP HIPs Task Team for a Series of Webinars around Maximizing FP Investments through Evidence Based Programming. Please join the Evidence to Action (E2A) Project for a Contraceptive Technology Update with Jeff Spieler on Wednesday, April 29 at the E2A office or remotely. Join The Chicago Council and a network of international thought-leaders for a discussion on how an investment in women’s health can lead to a more equitable and prosperous future. The event will also be streamed live. Follow #IWD2015 and #makeithappen on twitter for updates. These modules provide opportunities for the global health community to learn more about effective in-service training and pre-service education, and about key global health topics including family planning and reproductive health and maternal and newborn health. Watch captivating videos and read about the work APC is doing in Guinea, Liberia, and Sierra Leone to strengthen the health system and give hope to Ebola survivors. Advancing Partners & Communities (APC) advances and supports community programs that seek to improve the overall health of communities and achieve other health-related impacts, especially in relationship to family planning. Interactive data dashboard on youth sexual and reproductive health in Asia and the Middle East. 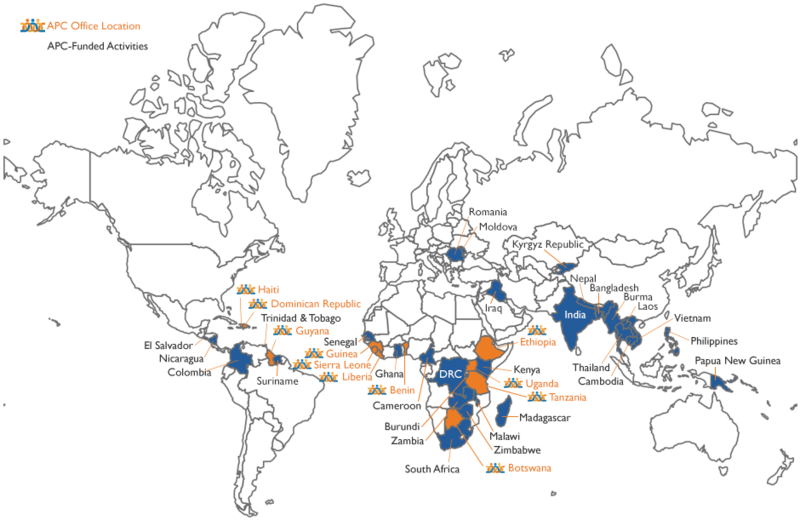 A snapshot of community health systems in different countries. Strengthening NGOs through APC's grant mechanism and capacity building assistance. APC works to advance and support community programs that seek to improve the overall health of communities, especially in relationship to family planning (FP). Through global technical leadership and collaboration, APC’s goal is to increase support for and commitment to community-based family planning in USAID priority countries. APC aims to increase access to quality FP services, expand the contraceptive method mix, and improve upon organizations’ capability to manage USAID funds and implement high quality and innovative community-based health programs. Afin d'améliorer la couverture sanitaire, le gouvernement béninois a lancé un ensemble d'interventions sanitaires fondées sur des données factuelles, dénommé PIHI (paquet d'interventions à haut impact), en 2010. À compter de 2012, le projet Avancement des Partenariats et des Communautés (APC) financé par l'USAID a aidé trois organisations non gouvernementales (ONG) et le Ministère de la Santé à introduire cet ensemble de services dans dix zones sanitaires prioritaires de l'USAID par les relais communautaires (RC). Avec l'aide d'APC, les ONG ont formé des RC et ont fourni un soutien et une supervision permanents pour mettre en oeuvre le PIHI dans leurs communautés. To improve health, the Government of Benin launched a package of evidence-based health interventions, known as PIHI (paquet d’interventions à haut impact), in 2010. Beginning in 2012, the USAID-funded Advancing Partners & Communities (APC) project helped three non-governmental organizations (NGOs) and the Ministry of Health (MOH) introduce this package of services in ten USAID-priority health zones through community health workers (CHWs). With APC assistance, the NGOs trained CHWs and provided ongoing support and supervision to deliver the PIHI in their communities. Since 2010, community health workers have provided education and services as part of the MOH’s package of basic health services and practices, known as PIHI. 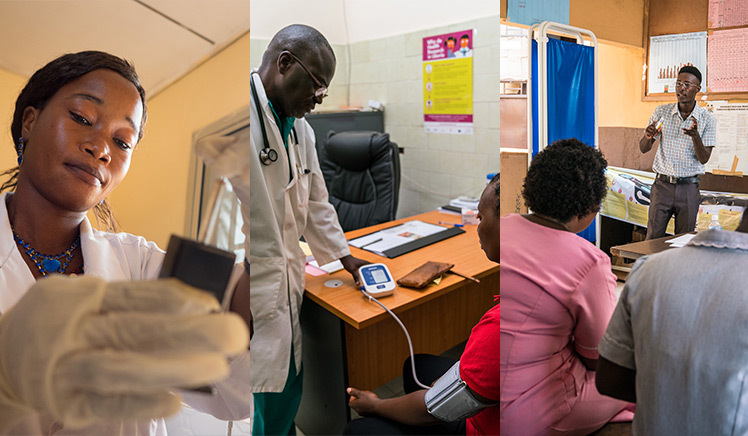 Critical to healthy, thriving communities, PIHI services help improve health areas related to malaria; water, sanitation, and hygiene; maternal and child health; nutrition; and family planning. As part of the APC work in Liberia, USAID has dedicated a rainwater harvester and wells constructed to supply water to two hospitals in Lofa County. The new wells and water storage system, as well as solar panels to provide energy to the wells, is part of the work to strengthen health services across eight counties in Liberia. Top photo credits (left to right): Puskar Khanal/JSI; Dominic Chavez/World Bank.